Water plays a crucial role in your lifestyle and overall health. So why wouldn’t you ensure harmful contaminants are removed? Making an investment in the right water ionizer pays dividends. Water that’s been treated to adjust its alkalinity or acidity has many health benefits. It gives you control over the water you drink. We’ll touch on these health benefits later. For now, here’s our picks for the best water ionizers on the market right now. Wins on overall performance & design. An internal 2-stage water filtering system produces premium-quality water within its sleek, modern design. Perfect for both everyday and periodical use. With 7 healthy water options to choose from, this is the best value unit we’ve found. If you’re looking for clean drinking water in a busy family home, this is the perfect choice, and at a reasonable price. If you’re on a budget, the Aqua Ionizer Deluxe 5.0 is an ideal choice. Energy efficient and space-saving, this water ionizer gives you full control in order to to quickly and easily adjust its alkalinity. 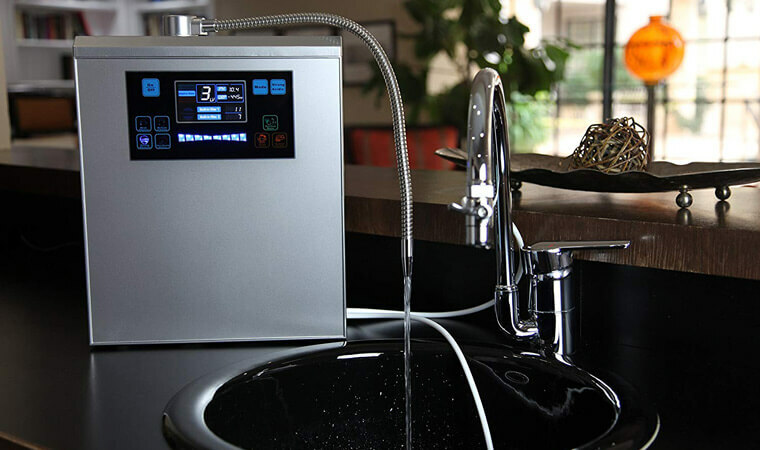 This may be a countertop water ionizer system, but its beautiful modern design ensures it’s no eyesore. It connects to either your faucet or directly to your water line, to give you delicious water at a pH level that suits your needs. A dual filtration system creates cleaner, more purified water. This is perfect for heavy users and busy households. Although, for more demanding users, there’s an optional 3-stage external filtration system. What’s more, these additional filters are included in your box free of charge. It’s just up to you whether you use them. Whilst it may come at a higher price point, the Bawell Platinum does come with free shipping. Plus, the price is justified with a purified water quality that’s difficult to match. Although, you will need a water pressure with minimum 20 psi. This water ionizer is ideal for heavy use and for those who take a real care in the quality of their water. Its quality build ensures this unit will stand the test of time. The Aqua Ionizer Deluxe 7.0 features seven healthy water options to choose from. Depending on your needs, you can choose from one of the four alkalized, or two acidic, water settings. Coming from one of the most trusted water ionizer brands, the Deluxe 7.0 is touted as being “worth every penny” by customers. In addition, the water quality is up there with the most expensive units on the market. Alongside an intuitive backlit LCD display, this water ionizer also uses reverse polarity in order to clean itself after every use. Plus, with a warranty of five years and a filter lifespan of 12 months, you’re protected against any potential defaults. Some customers have noted that the pH and ORP readings were incorrect, which is where a fantastic warranty such in incredibly handy. The Aqua Ionizer Deluxe 7.0 is ideal for anyone looking for a mid-range water ionizer, and once which has the assured quality of a trusted brand. It’s designed to be suitable for kitchens, bathrooms, or utility room faucets, meaning it’s as versatile as they come. When we said Aqua Ionizer was a trusted brand, we were being 100% truthful. We trust it so much, two of their units have made it into our top three. The Aqua Ionizer Deluxe 5.0 is somewhat of a younger sibling to the Deluxe 7.0. It comes at a lower price than its previously-mentioned counterpart, and is smaller, making it perfect for on-the-go filtration. This lends itself to the incredibly easy setup that so many customers have shouted about in their product reviews. Installation takes, on average, just 10 minutes. The efficiency of the Deluxe 5.0 shines through with every use. Self-cleaning technology and its energy-efficient ionizing system means it really stands out against the competition. Plus, with such a reasonable price tag, it’s easy to see why it’s so incredibly popular. If you’re just starting to love the idea of ionized water for drinking, or acidic water for other purposes, then the Aqua Ionizer Deluxe is a great starting point. Plus, a limited lifetime warranty and excellent customer service means you’re covered, no matter how long you have this system in place. Introducing entry number three from Aqua Ionizer: the Deluxe 9.0. If the 5.0 was the younger sibling to the 7.0, you can only imagine how the Deluxe 9.0 compares. Whilst you still have seven healthy water settings, the 9.0 allows you to add antioxidants to your water. This means the water is even healthier than regular ionized water, meaning more health benefits for you and your family! The Deluxe 7.0 is sold as a countertop unit, but can also be used under the sink if bought with an option install kit. Whilst it may not be as modern-looking as the Bawell Platinum (our best pick), it still looks at home either on-show or hidden away. Nine durable and energy-efficient plates, coupled with an inner filter, can clean and treat up to 4,000 liters of water before the filters require a change. The advanced filtration technology means healthier water is a given. However, if you live in a hard-water area then you may need to check calcium levels; the Deluxe 9.0 is known to struggle filtering this from time to time. The Life Ionizer MXL-15 certainly lives up the the XL nature of its name. Its 15 titanium-cored, platinum-coated plates are the most of any unit in this guide. A sleek countertop design, coupled with a one-touch control system, make this one of the most high-end water ionizers in today’s market. The MXL-15 will warn you when a filter requires changing, and has a high flow rate of 6 liters per minute. The MXL-15 boats the largest ionization chamber of any home water ionizer available right now. This increases the amount of time that your water spends within the chamber, which in turn passes on more health benefits into the water. When this is paired with 800 watts of energy-efficient power, more molecular hydrogen is made. This gives even more health benefits with every sip. If you expect to use a water ionizer day-in, day-out, either for a large family or if you have particular health challenges, then this system would be perfectly suited to your needs. Similar to the Bawell Platinum water ionizing system the HealthyWiser Alkaline Water Ionizer features a two-stage filtration system to give you cleaner, healthier water. Built from steel and platinum, this unit ticks all of the right boxes when it comes to quality. One stand-out feature is how easy the system is to use. With a large easy to read LCD display, touch sensors and an automatic cleaning system, the HealthyWiser takes out the guess-work. What’s more, it features an intuitive voice automation system. If you’re looking for the most technologically advanced water ionizer, then this is the one for you. Versatility is the order of the day with this incredible system. Whilst most water ionizers come in either countertop or under the sink, the HealthyWiser Alkaline Water Ionizer is fully convertible between the two. Speaking of versatility, you can use the water from this system for just about anything. From cleaning and food prep to personal hygiene and drinking, an extensive user manual gives you guidance on how to create different water types for different purposes. Now that’s versatility! Specifically designed for high-end kitchens, the Tyent UCE-11 is one of the most premium water ionizers available. Dual filtrations removes up to 99.9% of contaminants, while a super-fast flow rate makes for a seamless process from pipe to glass. However, the higher power and stronger filtering system does mean the filters require replacing around the six month mark, compared to the somewhat industry-standard 12 months. With that being said, another non industry-standard feature is its forever warranty. Including parts and labor, the UCE-11 is guaranteed to last you forever. With outstanding-tasting water and a premium quality build, you’ve expect (nor want) this system for any less than forever. In addition to its advanced technology, the UCE-11 boasts a multilingual voice-guided concierge service, as well as an interactive touch screen modeled after today’s leading smartphones. Its beautiful design is perfect for over the counter use, but there an under the sink version if you prefer a more discrete system. If you have the budget for a system such as the Tyent UCE-11, and have no problem paying a premium price for a product that’s nothing short of that, then this is the ideal water ionizer for you. The health benefits of ionized water are backed up by years of medical research. All you need is to read a handful of reviews from any of these products, and you’ll see time and time again how these water ionizers have helped those who have purchased them. Whilst there are said to be countless reasons you should be drinking ionized water, we’ve outlined the most common reasons that people will so religiously swear by ionized water. The exact effects of ionized water are still being researched across the globe, although many swear by these health benefits. When looking at real customer reviews, you can see for yourself just how life-changing it can be! Water ionizers are used to adjust the pH level in your water in order for it to better suit your needs. Whether it’s for household work, or if you want it for cleaner drinking water, these systems give you control over the water you use of a daily basis. When choosing your water ionizer, you need to understand the pH range you need. You may see a system with a larger range and believe that’s the one you should go for. But, why buy a system with a larger range if it’s not needed? Drinking Water: Drinking water is normally best at between 7 and 10 pH. This may vary depending on levels of antioxidants, but it’s always close to this in order to balance the body’s acidity levels. If you’re buying a water ionizer primarily for drinking water, then a huge range featuring a low pH should be less important to you. Instead, focus on reviews of water taste and how that particular water ionizer removes harmful contaminants from your water. Body and Hair: For external body use, 3-4 pH is ideal for neutralizing the pH levels on your skin and hair. These should normally be around 5-6 pH, but soaps and shampoos tend to throw this out of balance. Plants: Acidic water at a level of 5-7 pH is perfect for watering plants. A slightly acidic water is great for stimulating plant growth, although flowering plants prefer water with lower acidity levels to those that are mostly green and live in the shade. Disinfecting: Killing germs is a great way to use acidic water. A lower pH – around 2-4 – is best for disinfecting and is perfect for household chores. Even at a weaker pH of 4, around a minute of being soaked in the water is enough to kill germs. At a stronger pH or around 2.5-2, germs are killed on contact. As you can see, your water ionizer’s required pH range depends entirely on what its intended use is. Consider how you’d like to use your system, then choose one with a pH range that covers your particular requirements. Choosing between an under or over-counter water ionizer depends on the sapce you have at your disposal, as well as your desired system’s compatibility with your preferred installation method. If you have enough room to have your water ionizer on the countertop, then there are benefits to having it here instead of hidden away. You can see the LCD screen, making it much easier to configure your system’s settings and choose the water you’d like. Over-counter models ordinarily come in sleeker, more attractive looks than their under the sink counterparts. This is because they’re likely to be in clear view and, no matter how good the water may taste or how effective it may be for the housework, nobody likes an eyesore. Many people prefer an under the sink water ionizer. This is because it’s hidden from sight, and doesn’t take up any room sitting on the counter. Whilst this is convenient the majority of the time, you’re unable to at-a-glance check the water data as you can with a countertop model. Choosing between the two all comes down to personal preference and practicality. The majority of water ionizers come with in-built water filters as standard. They increase the purity of your water, which is especially useful when you’ll be using your system to improve the quality of your drinking water. The more powerful the filter, the higher its ability to quote with contaminated water. Depending on the tap water in your area, you may require a more powerful filter. If you have lower water pressure, better filters are suggested. This is so they can still be effective, even when the water is being forced through at a much slower pace. Some of the higher-end models even feature dual filtration systems, which remove even more contaminants and ensure your water is as high-quality as it can be. One consideration when looking at filter types is ongoing expenses. Whilst many filters require changing ever 3-4,000 liters, or every 12 months, the replacement costs for these vary from manufacturer to manufacturer. It’s also worth bearing in mind that some systems will require their filters changing more regularly. Depending on the amount you expect to use your system, you may only want to forego a two-stage filtering system if it isn’t required. Some systems also have optional filtering systems, which you could choose to not use at all, depending on the quality of your water already. A UV sterilization filter is a feature mostly reserved for higher-end models. Whether you need one or not depends on your personal preference, as many of the systems work perfectly well without one. However, there are some serious benefits to using a UV sterilization filter with a water ionizer. Ultraviolet light has the ability to kill harmful microorganisms, which is exactly what happens when water passes through this particular type of filter. Using a UV sterilization filter also means chemical-free water purification. Using ultraviolet light to disinfect water has been proven to be a safe and effective alternative to using chemicals. Water ionizers are used to create both acidic and alkaline water. As we outlined earlier in the buying guide, both have their difference uses. Alkaline water has a pH level of between 7 and 14, whereas acidic water is below the 7 pH of regular drinking water. Alkaline water is generally used for consumption, and has antioxidant qualities as well as a more refined, delicious taste than regular drinking water. Acidic water, on the other hand, is for external use only and should not be drank. Different uses require different acidity levels, with the lower, more acidic pH levels being harsher and more-suited to household chores rather than for bodily use. The difference uses of the two means that water ionizers are a great investment. You can choose your pH levels depending on your needs, giving you full choice in what you use your water for. ORP stands for oxidation reduction potential. In simple terms, it’s a method of measuring a water’s cleanliness and how adept it is at breaking down contaminants. The higher the ORP level, the better its ability to destroy contaminants. Higher ORP is great for cleaning, whereas a lower ORP makes for perfect drinking water. Generally speaking, the higher number of plates then the more capable a water ionizer is at producing a larger range of pH levels. Whilst the higher-end models tend to incorporate more plates, it’s worth considering more plates means more power will be needed to run the system. Do water ionizers require a power source? Yes, water ionizers are usually plugged into a main source of electricity in order to power the system. Many , however, are energy-efficient and can give you excellent results without the need for too much power. Will a water ionizer filter fluoride from my water? Water ionizers do not filter fluoride from your water. However, many manufacturers will have a fluoride filter as an optional extra. Many people use these with their systems and have noted how it has improved the quality of their water. How does water pressure affect performance? The lower the water pressure, the more work your system will have to do in order to create your ideal water. Many will not work with low-pressure water as the filters will not be effective enough. It’s always worth measuring your water’s psi and contacting the manufacturer if you’re concerned your water pressure will be a problem. With a vast amount of quality water ionizers on the market right now, it was difficult to pick the best. We looked at a number of different factors and, based on overall performance and quality, we had to go with the Bawell Platinum. With a huge pH range of 2.0 to 12.0, a dual filtration system and an industry-leading 12 month filter lifespan, the higher cost is more than justified. Plus, with a lifetime warranty, there’s no worry that you won’t be left without the high-quality product you paid for.